This drawing is in indian ink, black conte crayon and coloured inks. This church stands high above the village and quay and can be seen from miles around. I seem to remember having read that the tower at the east end of the church was used as a lantern to guide seafarers. Whether true or not it's an intriguing idea. I have drawn the building in such a way to draw out the height and slender character of the east tower. I may have made the original sketch on which this drawing is based when it was rather overcast but in the finished drawing I have made a more eventful and dramatic sky. 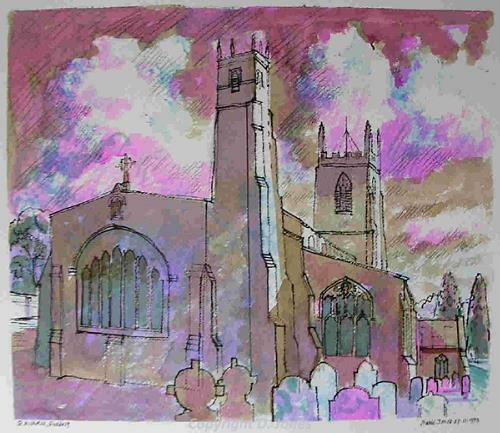 David has also been inspired by Salthouse and St Margaret's Church, Cley-next-the-Sea.